After the war on Hybern, everyone is still trying to heal as they prepare for the Winter Solstice. Feyre is still trying to figure out what her role is as High Lady, so she helps the Night Court rebuild their city. This book is mainly told from Feyre and Rhysand's point of view but we do get a couple of chapters of Cassian and Morrigan's point of view. 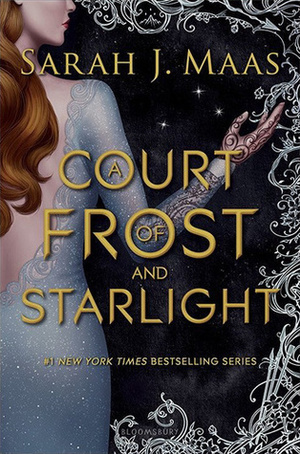 I really enjoyed this installment in the A Court of Thorns and Roses series, despite the negative reviews from a lot of my friends. No, it's not long and it's not suppose to be because it's a novella. It's suppose to bridge the gap between ACOWAR and the next book. It has been a while since I read from this series so I found myself just smiling the majority of the book because I love being back in Velaris with these characters. I missed them! Basically, the book is just everyone preparing for Winter Solstice. They all buy gifts for each other so there's a lot of time in the shops where Feyre is picking out items for her family. And we get a lot of time with Feyre and Rhysand. I think too much time! I oddly felt uncomfortable reading their intimate scenes because it was too excessive. Do we ever see them just being casual? It seems like every time they are together they are jumping on each other. Oh and I agree with other reviews about the overuse of the word 'mate'. WAY too much! Elain has surprisingly healed so much! I see so much improvement with her. But Nesta.. ugh. She was very irritating. She's cold to everyone and wants nothing to do with them. And yet expects so much from Feyre. I hope we see her grow more into her new Fae life in the next book. I don't think you need to read this book to continue with the next book that will come out but it's a fun and short read that it doesn't hurt to read it. I can't wait for the next series!